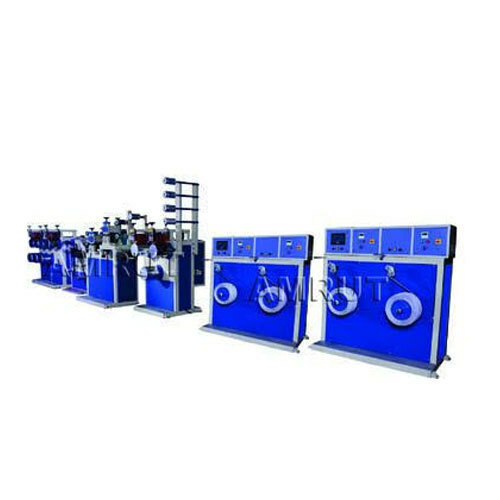 To meet the variegated demands of the clients, our company is instrumental in manufacturing and exporting excellent quality range of PP Strapping Machine. Precisely engineered at our well equipped manufacturing unit using sophisticated technology, these machines are demanded due to their better sealing efficiency, reliable microprocessor PCB control and hinged table top. This Machine finds huge usage in home appliance, food, chemical industry, printing, medicine production, general merchandise, post office and textile manufacturing industries. Amrut Plastic Engineers exporter started manufacturer of thermoplastic extrusion line for plastic processors at Ahmadabad with a small unit by Mr. Gunvantbhai Mistry, Now AMRUT supplied a number of different extrusion line in plastic extrusion field. Is one of the forerunners in providing the latest in extrusion machinery and ancillaries for a wide range of applications to the plastic processing industry. After making a humble beginning in 2006 within a short span, AMRUT has become a trusted name in the plastic processing industry as an ultimate & customized solution provider for the extrusion machinery. With an eye on continuous innovations & customer satisfaction, today AMRUT has made industry felt its remarkable presence in domestic as well as overseas markets. With help of strong teamwork and skilled engineers and hard workers, AMRUT day by day develop a number of lines and supplied “T” Die Sutli plant, PP/HDPE Box strapping plant, PP Net plant, Reprocess Plant recycling plant and Agglomerator, Mixer and Grinders. AMRUT supplied numbers of extrusion line in all state of India. AMRUT also touch in the export market and supplied T- Die Sutli plants, reprocessing plant and Box strapping Plant wide width in Nigeria, Kenya, Mombasa Ethiopia and Nepal. We are supported with a state-of-the-art infrastructure, enables us to provide optimum range of plastic machinees to our clients in a given time line. Furthermore, we are facilitated with well developed manufacturing unit, which help us to meet the specific requirement of our clients.